Step outside, and in moments, you will begin to feel the heat. Such heat and humidity create conditions fit for damp clothes, sticky bodies, and worst of all, parched mouths. Such heat demands extra nourishment. To replenish the body, Koreans eat special foods called Boyangshik. Boyangshik are special foods prepared and eaten during the hottest 30-day period in the lunar calendar of Sambok. This time period is also referred to as 복날, bok nal, which means the “dog days of summer.” According to the lunar calendar, Sambok is marked by three days: chobok (beginning), jungbok (middle), and malbok (last). 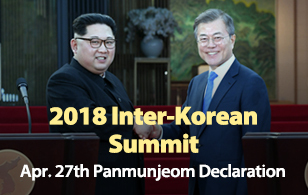 This year, chobok is on July 18, junbok is on July 28 and malbok is on August 7. The reason for Sambok is because of Korea's agricultural roots. At one time, most Koreans were farmers, so families worked the fields together to grow and harvest food. However, when it got too hot to work, Koreans would have to stop. The heat would be too much for the plants, the animals working the fields and the people working them. So, the best thing to do was to go on vacation. Often, most people would go to the sea. Also, on these days, people would eat fortifying and nutritious foods so when the weather cooled off, they could work. According to oriental medicinal theories, boyangsik meals warm the internal organs, which remain cold during the season. By warming up both the inner and outer body, a person would become remain cool and this would prevent illness. So what are boyangsik foods? Well, there are quite a few. The main characteristics are that the foods should be rich in protein and calories. First of all, there is Jangeogui, or broiled eel. Eel is traditionally rich in vitamin A and E, which helps blood circulation and skin. It is also believed to help those who suffer from rheumatism and pneumonia.This would be often grilled right after it was killed. There is also samgyetang, which is “ginseng chicken soup.” Both ingredients are believed to help promote heat in the body. 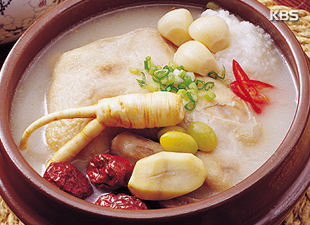 Samgyetang is also believed to helps replace all the lost nutrients from constant summer sweating. Chueotang is made almost entirely of mudfish, a fish found in Korean streams and rivers. The soup contains vitamins A, D and a lot of calcium (the fish bones are used). Additionally, the soup contains a high amount of protein and amino acids. It is believed that it strengthens the immune system, mucus membranes and skin. The controversial Gaejang-juk (dog meat) is also consumed during sambok. This soup is usually served with boiled dog meat, scallions and chili powder. The soup tends to be popular for its “male stamina” building qualities. Since dog meat is becoming less popular, however, many variations of this dish contain chicken and bamboo shoots. The modern equivalent is Yukgyejang which is made from beef. Other boyangsik foods are black goat which is made into a stew and duck. The logic behind boyangsik is quite simple. In summer, farmers needed food to replenish their bodies. The foods had to be small enough that they could eat all of it. In summer, butchering a cow would make no sense for they needed them to work the fields. Also, a pig would spoil before they could fully eat it.